The management of risk is fundamental to the successful execution of our Strategic Plan and to the resilience of our operations. During 2018 the Group successfully adapted its systems, processes and controls, adjusting to several significant changes in the regulatory environment including MiFID II, the rollout of its Brexit contingency plan and the introduction of the EU Benchmark Regulations. The Group continues to support its key markets and deliver stable and resilient services that meet our clients’ needs. The management of risk is fundamental to the successful execution of our Strategic Plan and to the resilience of our operations. Our formal risk framework codifies the objectives that drive consistent risk management across the Group. Our risk culture determines the manner in which we manage risks every day. Our management culture embeds risk awareness, transparency and accountability. A strong emphasis is placed on the timely identification and reporting of risk exposures and in the strategic analysis of prevailing or anticipated risks. The responsibility for identifying and managing risks rests with management and with the Executive Committee, with independent oversight from our Group Risk Management Team and from the Group Board Risk Committee. Our risk culture is one of our most fundamental tools for effective risk management. Our behaviour framework feeds into the criteria that we use to assess the effectiveness of our risk culture and the communication, escalation and use of risk analysis to make strategic decisions. The Group has an ongoing programme of development and enhancement of its Enterprise-wide Risk Management Framework (ERMF). The ERMF metrics and indicators include stress testing used to monitor risks against risk appetite to respond to emerging or unexpected risks, as well as ESG related risks which are embedded in the process and our policies. 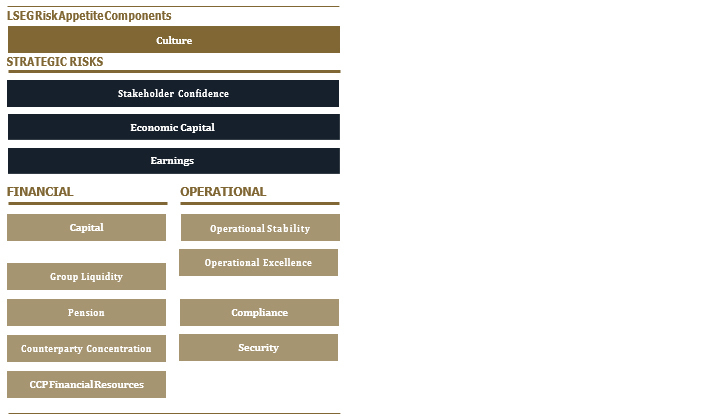 LSEG’s Risk Appetite is defined as the level of risk that the Group will accept in pursuit of its strategic objectives. The Group Risk Appetite Statement, proposed by the Executive Committee, is approved by the Board at least annually and is determined in conjunction with the Group’s strategy and aligned to the Strategic Risk Objectives. The components of Risk Appetite that relate to Central Counterparty Clearing Houses (CCPs) and Central Securities Depositories (CSDs) are also approved by the respective Boards within the Group, in compliance with EMIR, CSDR and other applicable regulations. The Group Risk Appetite is cascaded down to each business unit. Regular reporting at both Group and Business Unit levels uses Risk Appetite as a benchmark that can then be incorporated into the Group Risk Policy Framework. to the Board Risk Committee and to the Board for all aggregated Group risks. Key risk categories include strategic, operational and financial risks. Operational risk includes IT risk as well as risk associated with operational processes with financial risk including credit, clearing and market risks. We recognise that each of these risks, if not properly managed and/or mitigated, could have an impact on the Group and on its subsidiaries’ performance and/or financial and operational reputations. Indications of the relative sizes of these risk types are shown overleaf. Our approach to managing risks includes a bottom up and a top down approach. Key external and internal factors are stress tested across our Group operations to assess the potential impact on the financial results, strategic plans and operational resilience. The risk function is centralised at the Group level with the exception of the CCPs where each clearing house has its own risk team in compliance with the EMIR requirements and CSDs which have their own risk teams under the provisions of CSDR. The function’s main role is to maintain a fit for purpose Group ERMF and recommend to the Risk Committee and to the Board statements. It also reviews, analyses, monitors and challenges the risk profile of the Group and of its subsidiaries and ensures it remains within Risk Appetite. The function supports the Risk Committee members by providing reports on the Group’s risk profile and timely escalation of exceptions. It also monitors compliance with rules and regulations and develops and maintains frameworks to facilitate the identification, assessment, reporting and monitoring of all the principal risks that could materially impact the reputation, financial position or operations of the Group. The key to the Risk Management Cycle is that it begins with, and feeds back to, the Business Strategy – which is ultimately driven by both internal and external drivers. This ensures that the management and assessment of risk remains a fundamental component of the Group’s strategic decision-making process. LSEG’s economic capital model consists of four risk components (credit, market, operational and business), and enables the Group to consistently quantify its risk-taking activities. The relative contribution of each component to the Group’s total economic capital is shown in the chart below. Operational risk represents the largest component of the Group’s economic capital. The Group’s viability statement is underpinned by the Group’s stress testing process. Under this process, a set of severe but plausible scenarios appropriate to the business of the Group and reflecting our principal risks are defined by Management, and the financial impact of each on the Group is quantified. The stress test scenarios are re-assessed annually and may be updated either during this review process or at other times during the year where the external environment changes. on the Group’s key financial metrics: liquidity headroom; leverage; interest cover; and regulatory capital headroom. In addition, a set of compounded stresses was evaluated to provide further confidence on the ongoing financial viability of the Group even under very highly stressed environments. The process and final output of the stress tests was reviewed by management and by the Board, the Risk and the Audit Committees. They also reviewed and discussed ‘reverse’ stress testing, which was performed to assess what would be required to breach the Group’s covenants. The Directors’ financial viability statement is contained in the Directors’ Report on page 104. Each of the Group’s CCPs complies with the appropriate regulatory requirements. Consequently, they each manage their risk under the governance of their Board of Directors and of their internal risk management structure. The Group monitors the CCP’s aggregated risks positions by using tools that measure the overall exposure to counterparty risk, credit risk (including latent market risk where a default can result in a CCP having the market risk inherent in the defaulter’s portfolio) and liquidity risk. 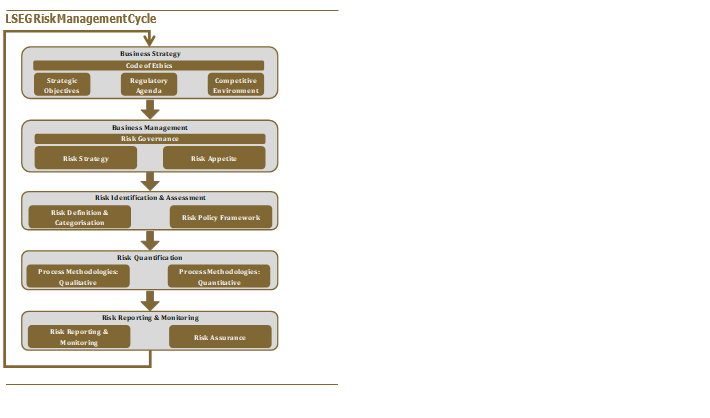 It uses a bottom-up approach for the monitoring of operational risks. The Group’s CCPs are managed in accordance with our ERMF, which includes a CCP Financial Risk Policy specifying minimum risk standards for margin confidence level, default fund cover, liquidity, counterparty concentrations, new member assessment, reporting and collateral. This promotes consistency in the oversight of our clearing risks while protecting the independence of the CCPs’ risk management processes as required by relevant regulation. The Group’s CCPs interpose themselves between 3 counterparties in a trade and assume the legal counterparty risk for eligible transactions that are cleared. If either party defaults on the trade, the CCP becomes accountable for the defaulter’s risk and associated liabilities. Fundamental to a CCP’s risk process is its collection of high quality and highly liquid collateral from clearing members and clients as security for potential defaulter risk. The CCPs have in place a variety of margin models, across asset classes, to calculate the collateral requirements appropriate to each member’s risk position. Clearing members are also required to pledge collateral to the default fund(s), the overall size of which, for each clearing service, is computed to at least the ‘Cover 2’ level – large enough to cover the 2 members that would create the largest liability given a simultaneous default under extreme but plausible market conditions – and allocated across the members of the clearing service. The adequacy of the CCP’s Financial Resources (Margins and Default Fund contributions collected from its members) is assessed on at least a daily basis and reported regularly in accordance with the Financial Risk Policy using Group Risk Appetite as a benchmark. The Principles for Financial Market Infrastructures (PFMI) produced by CPMI-IOSCO and EMIR provide the minimum Risk Management standards that a CCP should apply; however, LSEG CCPs apply more stringent margin confidence levels in most cases. If a clearing member fails, the collateral collected is used by a CCP to complete the trades and fulfil the failed organisation’s obligations. This ensures that the party on the other side of the trade is not negatively impacted by the default. The margin is calculated to cover market moves up to a certain confidence level. If losses exceed the defaulter’s financial resources, then under EMIR Regulation the CCP is required to utilise a specified proportion of its own capital ‘skin-in-the- game’ before it can utilise the assets of non-defaulters. The skin-in-the-game represents a proportion of the CCP’s own capital that is sufficient to act as an incentive for CCPs to minimise the operational risk related to default management and to adopt robust risk management processes. Once the skin-in-the-game has been exhausted, further losses are allocated to the non-defaulting members via funded member contributions to a mutualised default fund for each asset class or group thereof followed by further cash calls known as assessments and then a loss distribution waterfall set out in the CCP rulebook. CCP operational risk is managed using a bottom-up approach and is aligned with the Group’s operational risk management approach. Further information on the Group’s clearing related risk is contained in the Principal Risks and Uncertainties on pages 49–50. Each Group-level risk is owned by a member of the Executive Committee who is responsible for managing or mitigating the risk in order to remain within Risk Appetite. The Board and the Risk Committee receive presentations on material risks and related mitigants as appropriate. The Reports of the Audit and of the Risk Committees, on pages 65–71, provide details on the work carried out to assist the Board in fulfilling its oversight responsibilities for risk management and systems of internal control.